Until now our understanding of marriage in China has been based primarily on observations made during the twentieth century. 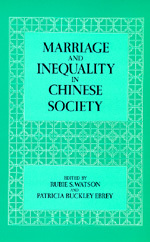 The research of ten eminent scholars presented here provides a new vision of marriage in Chinese history, exploring the complex interplay between marriage and the social, political, economic, and gender inequalities that have so characterized Chinese society. Rubie S. Watson is Associate Professor of Anthropology at the University of Pittsburgh. Patricia Buckley Ebrey is Professor of Chinese History at the University of Illinois.